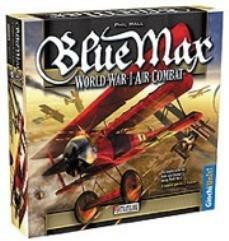 A game of World War I aerial combat, players in Blue Max take on the roles of pilots belonging to the Allies or the Central Powers, aiming to shoot down as many enemy planes as possible. With rules that account for altitude, fuel reserves, and the maneuverability of your plane, Blue Max places you squarely in the cockpit! Produced in conjunction with Italian game publisher Stratelibri, this new edition of the board game of high-flying dogfighting during a wartorn era features new graphics by Kurt Miller and updated rules for two to six ace pilots.